Posting will be light next week, as I won’t have my laptop with me (how will I survive??). But continuing this week’s spotlight on South-East Asian cuisine, earlier in the summer I visited Kuta – a “fancy” Indonesian restaurant on the Lower East Side. While Indonesian food is distinct in its own right, there is some overlap with Singaporean/Malaysian cuisine. I had a Singaporean with me that night, and he was prepared for the real deal. How did Kuta live up? Alright, I’ll be honest – $7 for this dish is not outrageous by NYC standards (though it is outrageous for most places outside NYC). However, just knowing that these puffs were priced at such a premium was a little disheartening. Eventually, this fact didn’t stop me from eating them. Yeah, I got over it. We also had the Indonesian Madura Satay. Kuta had quite an extensive satay menu, so I had high hopes for this appy. 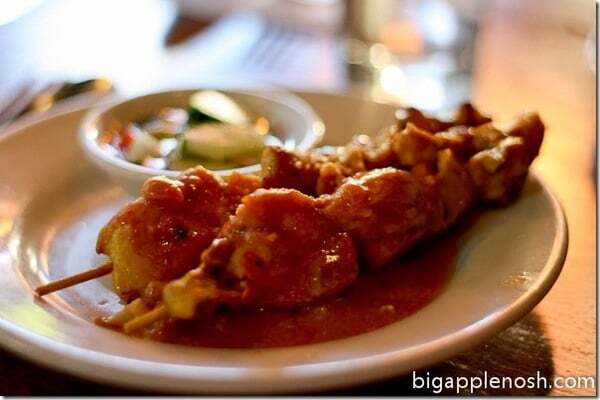 Satay, or “meat on sticks” as I so maturely call it, is usually not my fave – the meat is sometimes over-cooked and tough. However, Kuta knew their stuff for this one – the chicken was juicy, tender and flavorful. I’d recommend. 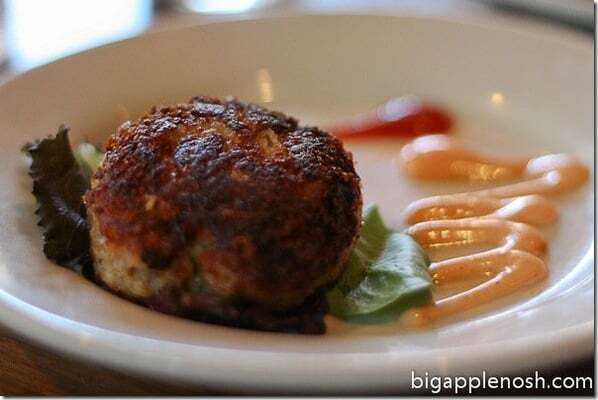 Our final starter was the “Jimbaran” Crab Cake, with lump crabmeat, red & green bell pepper, onion and spicy aioli. The cake was nicely seasoned without being overly salty, with large chunks of crab meat. The aioli provided a creamy tang to the seafood. The first entree was the “Indonesian” Nasi Goreng of chicken fried rice, fried egg, sweet soy sauce, and beef madura satay (first picture). The quotes around “Indonesian” confused me – after all, this is a traditional Indonesian dish. Anyway. Nasi Goreng is a type of fried rice – this one was not bad, although it relied a little more on the soy sauce than the Nasi Goreng I’ve sampled previously. 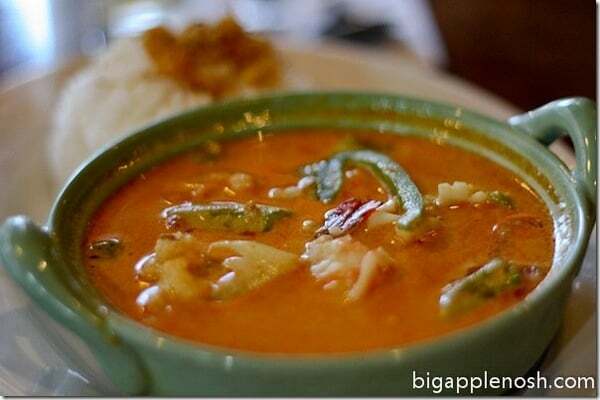 The second entree was the Seafood Laksa, with shrimp, squid, mixed vegetables and pineapple in a spicy coconut curry. I LOVE laksa. Whenever it’s on the menu, I order it – there’s something about the sweet creamy coconut and the warm spice of the curry that is so satisfying. Kuta’s version was pretty good, but the portion was a little small – I’m used to my giant hulking bowls of laksa. 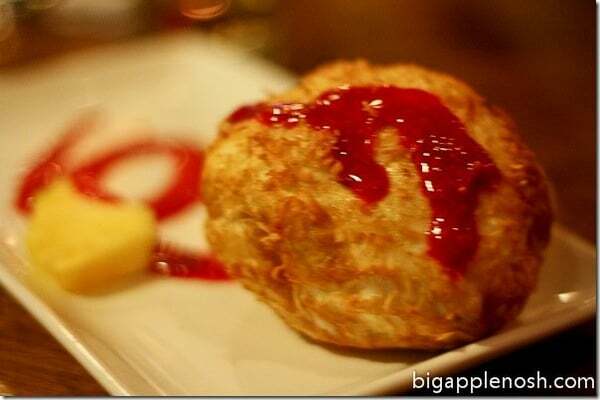 For dessert, we ordered the Coconut Crusted Fried Ice Cream, with raspberry sauce and pineapple. Decidedly not authentic, it was nonetheless excellent. I mean come on, ice cream + fried? Count me in. Kuta was fine. The food was not bad; the restaurant is trendy in that “Lower East Side trendy restaurant” way – the consequence of which is smaller portions for higher prices. I’d recommend Kuta for the scene, knowing that you will not get the most authentic Indonesian fare. If you do decide to stop by, make reservations – the restaurant is small. Not the most authentic, but not bad. 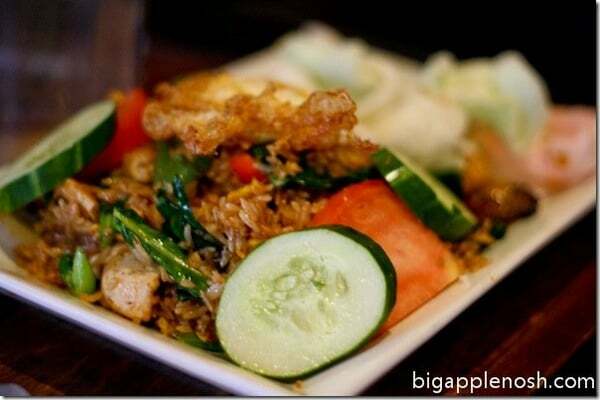 Have you had Indonesian cuisine before? Like? Dislike? My Interview with Ted Allen! 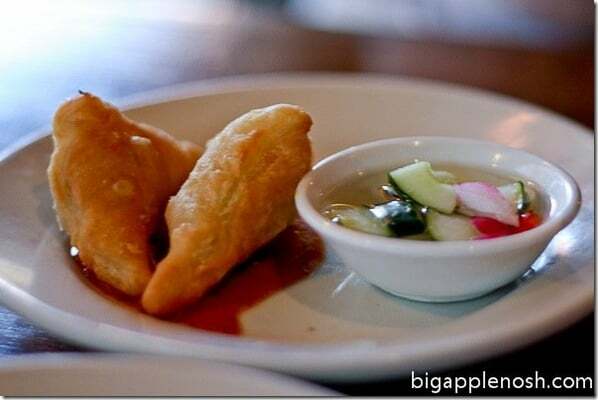 I was lukewarm about an Indonesian place we tried here in San Francisco a couple of years ago. Even though not authentic, that fried ice cream looks delish! OH this gets a big YUM from me 🙂 Hope you have a fabulous weekend. And good luck without the laptop. I know how hard that can be! They served you laksa with rice, like a curry? What gives? That's funny that they named it after a place in Bali. 🙂 There's also an area of Bali called Jimbaran that's known for its beachside seafood places. There is a actually a pretty authentic Indonesian place in Queens, but it's part of a mosque that they open to visitors to eat from time to time. I wrote the name somewhere that I need to find. YUM! your making my restaurant list longer and longer with every post. Seriously all I am going to do in NY this winter is stuff my face!! But I will be happy doing it too! yummy! i love your blog!! oh yum!!! now i'm hungry! i've passed this place a few times and wondered if it could be any good. i think i'll skip it now. This looks amazing!!! So hungry now! I just heard this thing on the radio about hollywood star Tom Truong up coming movie The Second Coming of Christ. It’s a movie about the son of God reborn to earth to save us from armageddon of December 21 2012.